Well here is the long awaited review of Belfort. I want to apologize to Michael Mindes, Jay and Sen-Foong, and the rest of the folks at TMG for it taking me SO long to get this done. There are a couple of reasons for this. First, I really feel that I need to play a game at least three times to fully review it. And I couldn’t get anyone at my game group to take the plunge. I don’t understand it except that it was rumored that the game was looong and no one wanted to commit to it. Second, I didn’t realize that Belfort was just beyond the ability of my primary gaming partner, my son. At the time he was 9 and it just didn’t gel with him. So we waited. Now he is a gamery gamer and really likes the game. So lets get to the review. Abstract: Belfort is a worker placement game. Using elf and dwarf workers, players collect resources. They then use these resources to build the building of Belfort. Players score based on how many buildings they control in each district of the city. Components: This game has a ton of components. Lots of wooden bits, heavy cardboard tokens and boards. You really get your money’s worth with this one. The production of Belfort is very good. Tasty Minstrel Games has done a fantastic job. The components are well made. The Josh Cappel art is fantastic. It is whimsical and offsets the heaviness of the game. Josh is a very popular game artist and this game shines because of his skill. 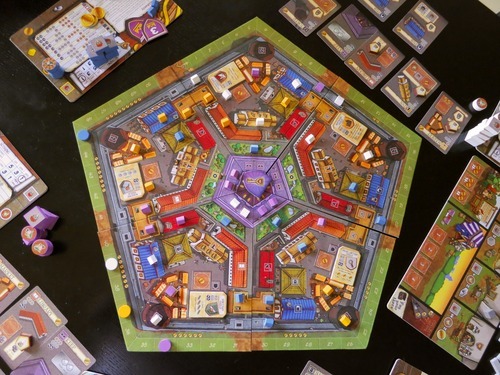 Belfort has a pretty unique pentagonal board representing the city with the various guilds and building depicted as well as a score track. There is a side board where resources are obtained. Both are made of a heavy cardboard. 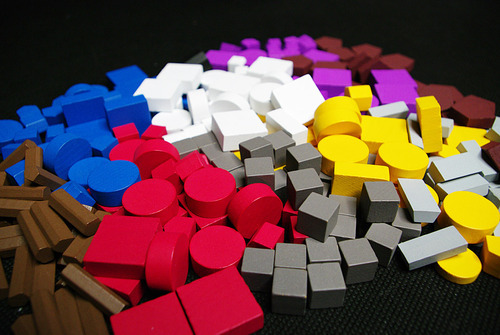 The game board wedges show the building that can be built and the guilds that are available. Players place either their workers on the guilds or their player markers on the buildings to claim them when built. The cards look nice and are the buildings that can be built. The buildings give extra abilities when built. The game comes with wooden elf, dwarf, gnome, and resources bits that are well made. 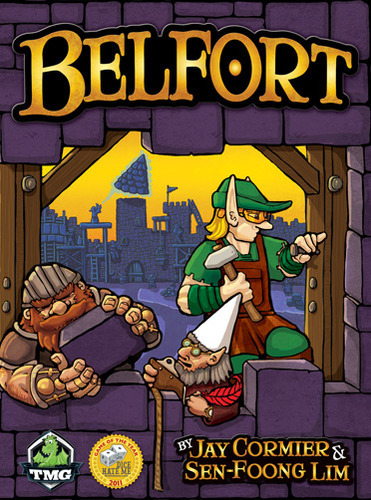 In Belfort players are master builders constructing the city of Belfort. They use their workers, Elves, Dwarves, and Gnomes, to obtain resources and perform actions. The resources are used to build the buildings of the city. Buildings give extra abilities and lead to victory points. And victory points are what it’s all about. The game has seven turns (three of those are scoring turns) and there are five phases to each turn. Those phases are move the calendar marker, place workers, collection, actions, and scoring. On a turn, players, in turn order, place one of their workers. Workers are placed on the planks areas of either the Guilds on the board or on buildings the player has built. If the player chooses to place on a Guild, they pay a coin and place a worker token on that Guild’s plank. Players can also place workers on the building they have built. Guilds and Buildings give the players special things during the Collections phase. This continues until either everyone has placed all their workers. Or someone passes. When a player announces that he is passing, the rest of his workers go to the three spaces of their choice on the resource board. Play continues as before until everyone has passed or all workers are placed. The game now moves to the collection phase. During this phase, players collect the resources from their workers placed on resource producing spaces from the Guilds, Buildings, or Resource Board. They also collect any income from their buildings and pay taxes if applicable. The Actions phase is next. Here the players can perform the actions from Guilds or Buildings. Or they can build buildings using the resources they have collected. If bui lding, the player plays the building card in front of them. They then place one of their building tokens in one of the sections of the board on one of the buildings that matches the building card they played. If it is a scoring turn, players score points based on two criteria, area control and number of workers. To score area control, players go section by section and the player with the most buildings in each section scores the most point. Next players score based on who has the most elves, who has the most dwarves, and who has the most gnomes. Scoring markers are moved along the score track on the outside of the board. The turns continue for six more rounds then the final scores are tallied. What we think: My son is 10 and loves it. My 14 yr. old daughter killed us in her second game. And I agree with them. This is a very good game. First though let me get the one cavet out of the way. The game can run long timewise. It averages about 1.5 hours but can go as long as 2.5 at times. With that out of the way on with the good stuff. Belfort is well designed and plays smoothly. The theme of the game comes through well thanks to the art and graphic design. It is easy to teach but has a lot of depth. The endgame can really sneak up on you if you are not paying attention. You need to balance obtaining resources and building to be successful and this is not easy. It has hard decisions and multiple choices and paths to victory. All of these are qualities of a great game. And I place Belfort in the Great Games category with an 8 on the BGG scale. 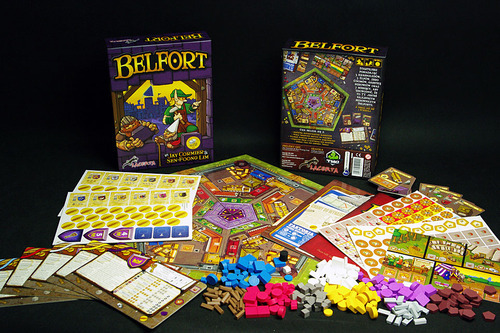 For more information about Belfort you can find it here on BGG or go to the Tasty Minstrel Games. All photos were obtained from BGG and are the property of their various owners. I would like to thank Tasty Minstrel Games for the review copy of Belfort.